Older youth in foster care sometimes endure so many challenges that achieving permanency ceases to be of interest to them. "Their goal often is just to get out of the system," said Deb Thomas, a child and family preparation technical assistant with Family Design Resources, "and to have everybody out of their lives." It's logical to try to convince them otherwise given the negative outcomes associated with aging out of care without permanency. But Deb said persuasion may not be effective. "If we go in telling them they need to have a family, they are likely to resist being told to change how they think and feel," Deb said. "We need to hear what they're saying and listen for the change talk, which indicates a willingness to consider a different mindset." "Change talk" is at the heart of motivational interviewing, or MI, which has been described as a "collaborative conversation" aimed at strengthening a person's motivation for positive change. This technique was first described in 1983 in relation to work with problem drinkers. Deb sees great potential for MI's use in conversations with older foster youth who have given up on or rejected the idea of permanency. She attended an MI training session in November at Millersville University that covered the "spirit of MI" and four major skills associated with the communication method. Open-ended questions: These are designed to elicit full, meaningful answers. But habitually using open-ended questions takes self-awareness and intentionality and can feel contrary to typical social work practices, such as action planning and completing forms, Deb said. "As child welfare workers, our job often is to gather facts, which can distract us from using active listening," Deb said. Workers have to put aside practice techniques that feel comfortable after years of use and purposefully change how they converse with youth. Foster youth may interact with multiple professionals regularly, so creating openness on a one-to-one basis is critical. Asking open-ended questions, Deb said, "would work really well with our kids because it demonstrates collaboration, helps establish rapport, shows that we're interested in what they have to say and gets them talking." MI seeks to demonstrate discrepancy: to explore with youth the life they would like to live as compared with the life they're living now, and to help them see how they are getting in the way of their visions for themselves. If youth can see that discrepancy, they can see what changes they need to make, and possibly how a family may have a place in their lives. "That is the foundation of MI—that people are more willing to change when it comes from them and not from someone telling them to change," Deb said. Affirmation: This acknowledges a youth's effort and identifies underlying strengths that contributed to successful effort. "Most social workers want to provide affirmation but perhaps go about it the wrong way, and it ends up being what I call 'false praise,' " Deb said. She offered the example of a youth who, after being late for previous meetings, now arrives on time. False praise would be to gush over the achievement instead of citing something factual and specific that made the on-time arrival possible, such as setting an alarm clock or putting clothes out the night before. Effective affirmation helps the youth identify the strengths that made the behavior possible. "Praising kids for expected normal behavior or giving compliments is not affirmation," Deb said. "And I think that's more embarrassing to them than affirming. Praise does not cause the youth to reflect on his effort and what strengths he discovered that enabled him to make a change. Affirmation does that." Reflection: Here, the interviewer relates what he understands the youth is saying. "We assume we understood what they meant when they said it, but maybe we didn't and should check," Deb said. "Youth will let you know if you're right or wrong." The Jim Casey Youth Opportunities Initiative stresses the importance of youth voices being heard and treated as worthwhile. Not only does reflection clarify, but it also expresses interest in what a youth is saying and continues to engage and elicit change talk. "Reflection might be, 'I hear you say it would be OK for someone to be there for you when you age out of care.' That's a way of reflecting back to them, 'I hear you saying maybe you do need someone as a mentor or a go-to person in your life,'" Deb said. Summarization: Summaries can be used at the end of a session or to transition to new topics. This is a way for social workers to relate what a youth already has said, especially any ambivalence toward change, and help them carry that forward to the next topic or the next session. This acknowledges that the worker has been listening, validates the youth’s position and encourages the youth to explore it further. 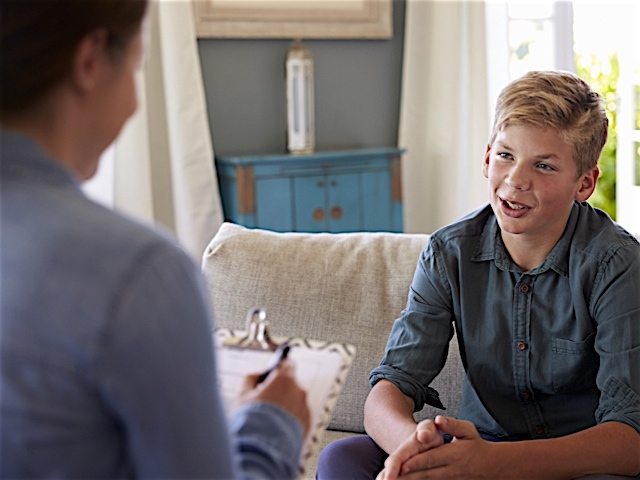 Motivational interviewing skills can help foster children move from resistance to acceptance of permanency, thereby better preparing them for adoption. Older youth who are impelled to participate in recruitment activities, such as matching events and creating promotional materials about themselves, increase their chances for permanency. "We want our kids to believe they can achieve the visions they have for themselves," Deb said, "and that this ability resides within them but hasn't been explored yet."